Hazardous Materials Storage can be volatile and dangerous if it is not in the correct storage atmosphere and/or maintained properly. It is equally important that hazardous materials storage is maintained and managed using a high level of safety. Storing hazmat in hazardous materials storage containers is a safe and efficient way of housing flammable or combustible inventory. Maintain your hazardous materials storage containers with temperature control systems by US Chemical Storage. It is necessary that proper equipment is worn before entering hazardous materials storage containers. Protective equipment prevents exposure to hazardous materials and will keep you safe. Overexposure to hazardous materials can result in a decrease in health or even death. Hazardous materials storage containers provide safety and compliance for personnel, investments, and facilities. Keep your hazardous materials laboratory storage safe with a hazmat storage container today. Hazardous materials storage containers are designed to either be fire rated or non-fire rated and can be fully customized to meet any specific requirement. Designed by professional engineers and experienced, certified welders for high-quality assurance. Constructed from heavy gauge steel and finished with an epoxy top-coat for chemical resistance and protection from severe weather conditions. Store your flammable and combustible materials safely with an EPA, OSHA and NFPA approved building by US Chemical Storage. Store pallets, drums, small containers or large containers with a hazardous materials storage container to keep your flammable or non-flammable storage compliant. The US Chemical Storage Chemical Storing Guide contains listings for 357 chemicals and chemical groups. The Chemical Storing Guide provides factual information on each chemical regarding its material safety data sheets (MSDS) and proper storage practices. When storing specific chemicals, it is necessary that other chemicals are stored separately. 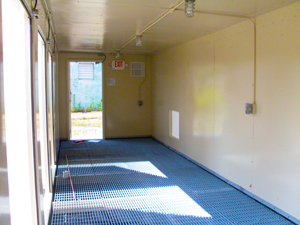 Segregation practices such as a different hazmat storage container or a solid partition wall provides compliance and will work to prevent hazardous situations.